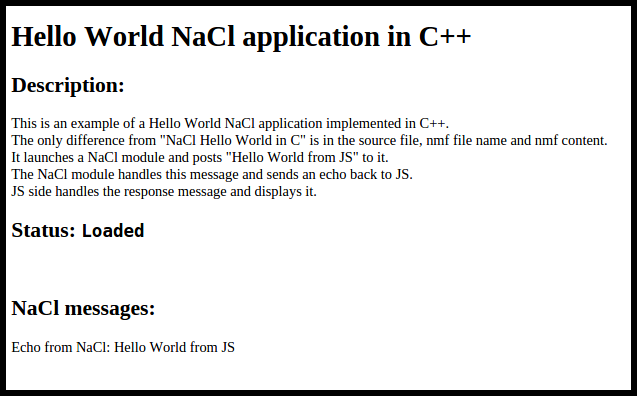 This topic describes the "Hello World in C++" sample application implementation. Define the CreateInstance()function, which creates an instance object derived from the pp::Instance class. In the sample application, the class constructor and destructor are declared explicitly, but have been left empty. Implement the explicit class constructor for the instance. To initialize the instance properly, the constructor must call the base pp::Instance(PP_Instance) class. In the sample application, the class destructor has also been declared explicitly, but has been left empty. Convert the message to a std::string object and append it to the predefined echo message. To notify the browser that instance initialization is successful, implement the Init() function. For more information on the HandleMessage() and Init() functions, see the "include/ppapi/cpp/instance.h" file in your "nacl_sdk/pepper_xx" directory.